My name is Matt Winick from Ann Arbor, Michigan and I have a strong interest in learning history including social justice. In these subjects, I like to learn the need to make Civil Rights stronger to reduce discrimination, protect the environment from pollution, have criminal justice reform to help protect people’s rights while reduce crime, and many others. 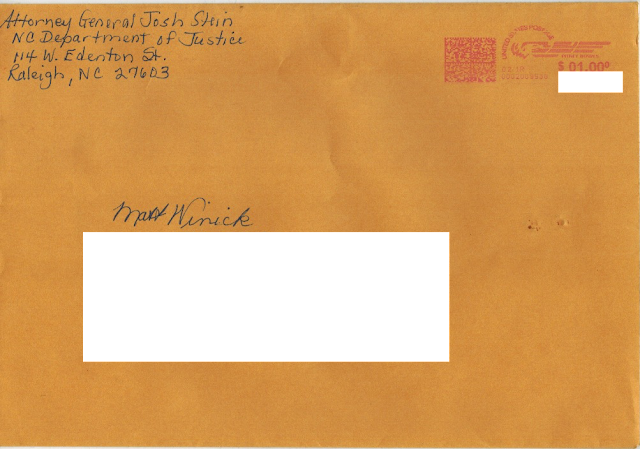 Attorney General Stein, the main reason I’m writing you a letter is to explain how I find your work when you served as Member of the North Carolina Senate from the 16th District and as currently serving as 50th Attorney General of North Carolina to be very inspiring to me. When you served as Member of the North Carolina Senate from the 16th District from 2009-2016, I truly appreciated on how you were a strong supporter of Civil Rights to help protect women, minorities, and people with disabilities from being discriminated, support funds for renewable energy to reduce addiction to oil with gas, and strong support environmental protection to help keep water resources including parks clean to make them safe for people to use. Another thing that I liked about your work when you served in the North Carolina Senate was how you pushed to expand the DNA database to help track violent criminals for cases to remove them from the streets, implemented School Safety Act to help train teachers including school officials to find ways to help protect children from dangerous criminals or reduce bullying, and expand better protections to hide identity of victims of domestic violence from abusers. In your current role as 50th Attorney General of North Carolina, I truly appreciate on how you support Civil Rights by advocating for people with disabilities’ rights, prosecuting people who commit hate-crime to help protect minorities including people who are different, and investigating public places that practice different forms of discrimination or violate civil rights legislation. Supporting drug treatment programs to help drug-users get the care they need to reduce drug-abuse, working with law enforcement resources to expand resources to help victims of crime or victims of domestic violence get help on dealing with their trauma, and expressing the need for more funds to improve DNA testing including forensic science to help solve evidence efficiently while reduce sending an innocent person to jail is common sense for criminal justice reform. Another thing that I like about your work as Attorney General of North Carolina is how you went after public officials who are corrupt or accepted illegal bribes, prosecuted industries that illegally polluted the environment or violated environmental protection to improve public health while reduce pollution, and partnered with law enforcement to investigate financial companies that practice fraud or predatory lending. Attorney General Stein, I have autism with a learning disability. Having a disability is hard for me because I have trouble comprehending on learning different advance subjects, sometimes I struggle to communicate my thoughts, and get teased. 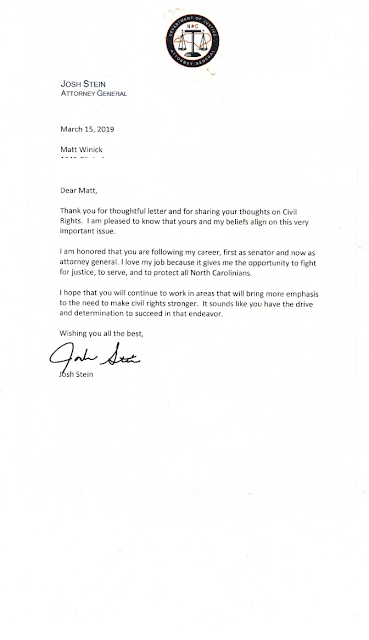 Your commitment to be a strong supporter of Civil Rights including people with disabilities’ rights really inspires me to work hard on my disability. Your role as former Member of the North Carolina Senate from the 16th District and as current 50th Attorney General of North Carolina gives me motivation to continue to learn history including social justice. My future goal is t someday work in these areas to help emphasize the need to make Civil Rights stronger to reduce discrimination, have criminal justice reform to help protect people’s rights while reduce crime, protect the environment from pollution, and many others. I strongly believe that you are making a great difference for society. I’m very proud on how you are working hard to support Civil Rights, push for criminal justice reform, standing up for victim’s rights, and many others. You have inspired me to work hard on my disability, learn about your work in public service, and inspiring me. I wish you the best to continue to make a great impact on society through your role as Attorney General of North Carolina.